Destructor, called after destructors of BaseLevelCrankNicolson subclasses. 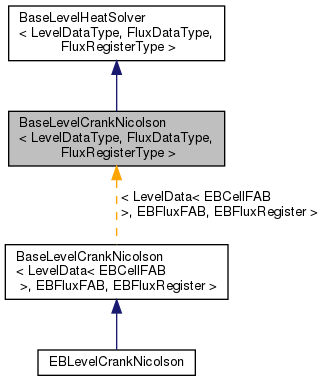 Initializes the base class of a CrankNicolson time integrator. This must be called by any subclass of BaseLevelCrankNicolson. a_grids The DisjointBoxLayout on which the CrankNicolson scheme is to operate. a_solver An AMR Multigrid solver for solving the linear systems at each stage of the CrankNicolson integration scheme.